Either someone asking it of you or suggesting you ask it of yourself? I understand the premise of the question too and why it’s suggested we ask ourselves this. So that we can identify what we really want for ourselves without fear holding us back from being open, truthful, and honest with ourselves. And while I understand this, I think it’s a terrible question and one I’ve stopped asking myself. Because regardless of what goal or dream I pursue, I know there’s always a chance of failure. This goes for every goal I’ve either already achieved or am still in pursuit of. When I decided to move to California at the age of 23, I knew there was a chance I would fall on my face out there and move right back home. Luckily that didn’t happen and it was during this time that I grew the most, personally and professionally. I knew when I started my own business at the young age of 25 there was a chance it would fail. Sure enough, 4 years later it did. I knew there was a chance of failure, that I wouldn’t be able to finish, when I set out to run a 50 mile race. I did finish it and cried my eyes out at the end not in pain, but in celebration in overcoming something that just 10 hours earlier had terrified me. I knew there was a chance of failure when I got married in 2007. Unfortunately the marriage did fail and I got divorced. 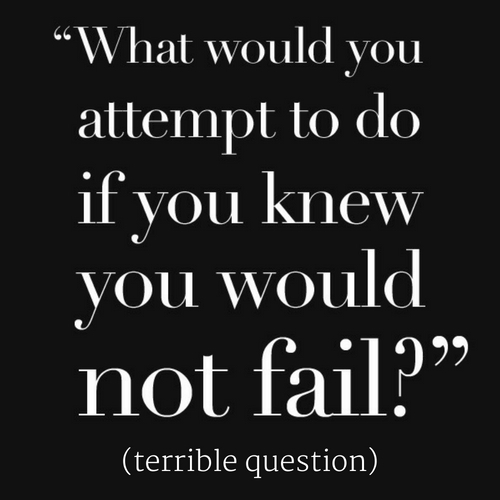 If I asked myself the question, “what would I attempt if I knew I could not fail?”, the answer would be… nothing. Because the chance of failure is always there. Everything I’ve ever attempted in my life I did so knowing perfectly well there was a chance of failure. I’ve never invested my time, energy, effort into something or someone with the belief that failure wasn’t a possibility. Of course there was a chance I’d fail… the race, the business, the relationship. There’s risks in every one of these but the risk I’ve always been most concerned with is looking back on my life and wishing I would have done something different. That I would have taken action on something I knew I wanted but was to scared to go after it because of the chance of failure. And while failing doesn’t feel good hurts really bad sometimes (physically, mentally, emotionally, financially), I rather have tried and failed than never have tried at all.